Passengers are recommended to arrive the day before their trip departs. Airport pick up on arrival and one night's pre-trip accommodation in a dorm bed is included in the trip fee. The trip departs from Cape Town early on Sunday morning. Anyone wishing to explore this beautiful city and see its many sights should plan to arrive in time to do so. 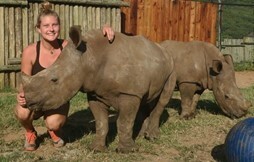 Amanzi Travel can suggest accommodation options and activities and excursions in Cape Town for those who plan to visit. Wine Tasting; Half day canoeing on the Gariep (Orange) River; Fish River Canyon; Namib-Naukluft National Park; Transfer to Sossusvlei; Swakopmund; Spitzkoppe (day trip); Etosha National Park; Okavango Delta Excursion; Chobe Overnight Excursion; Victoria Falls Entry; South Luangwa National Park; Lake Malawi; Dar Es Salaam , Zanzibar Ferry, Zanzibar Excursion, Spice Tour, Sunset Dhow Cruise and Serengeti Excursion. 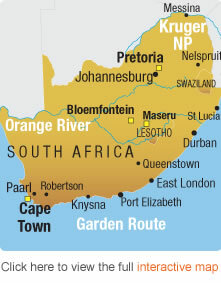 Leaving Cape Town, the tour will head around Table Bay and then north through the wheat growing 'bread basket' of South Africa before crossing the Piekenierskloof Pass into the rich fruit growing area along the Olifants River, named for the vast elephant herds that used to roam this fertile valley. Travelling north from the Cederberg area the region known as Namaqualand is reached, well known for its prolific display of Namaqua wildflowers that occur each spring. After stopping for supplies in the small mining town of Springbok, the journey continues on through the desert area of the Richtersveld to the Gariep River, the natural land border between South Africa and Namibia, where the night is spent at a beautiful campsite on the South African bank of the river. Located in the south of Namibia, the Fish River Canyon claims the title of the largest canyon in Africa and the second largest in the world. Being approximately 160 km long, 27 km wide and just over 550 m deep only allows for the brave and fit to take on the hikes and walks it has to offer. This morning the group will enjoy a half-day canoe trip on the beautiful Gariep River, affording the opportunity of some bird watching or just a scenic and relaxing paddle. After lunch the crossing into Namibia is made where, after a short drive, the Fish River Canyon is reached. At 161 km long, 27 km wide and about 550 m deep, it’s the second largest canyon in the world. The outer canyon was formed by tectonic activity, while the erosion of the Fish River formed the inner canyon. A road follows the eastern rim, giving access to several viewing points from where spectacular vistas can be observed. After an early start the tour will head north to enter the area of the Namib-Naukluft desert, one of the oldest in the world. 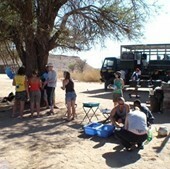 The group will base themselves at Sesriem, a good place to experience the Namib and its many moods. A short distance away is Sossusvlei, surrounded by a dramatic sea of sand dunes reputed to be the highest in the world. Magnificent views of the desert can be seen from the top of the dunes, some over 300 m high. The stars in this part of the desert put on a show like nowhere else in the world. This morning the group will enter the Namib-Naukluft Park and the morning will be spent exploring this amazing area. Time will be taken to climb to the top of Dune 45 - a truly memorable experience. Following this once in a lifetime experience there will be the option to take the desert shuttles a further 5 kms into the desert from where it i possible to walk to Sossusvlei and explore the surrounding area. This morning after breakfast the tour will set off in a north-westerly direction to meet the Atlantic Ocean at Walvis Bay. The drive takes in the Tropic of Capricorn - the imaginary 'line' that shows the southernmost point of direct sun, and signals the southern hemisphere's mid-summers day. From Walvis Bay the coast will be followed for some 35 km to arrive at Namibia's prime holiday resort - Swakopmund - where two nights of rest, relaxation and a little bit of adrenalin for those that are keen. Accommodation will be in dormitories for the next two nights; upgrades into private rooms may be possible dependent on availability, and can be booked with the trip leader. Founded by the Germans in 1892, their colonial influence is still evident today. Swakopmund has a selection of excellent coffee shops, restaurants and bars as well as many arts and crafts shops selling Namibian curios. There are fine beaches to walk along as well as a great museum, aquarium and galleries to visit. Alternatively the lovely beach and promenade make for a great relaxing walk - though bathing in the ocean may be somewhat chilly. Some fellow passengers will leave in Swakopmund to be replaced by new passengers joining for the rest of the trip. Optional activities include sky diving, quad biking, sand boarding, scenic desert flights, dolphin cruises, fishing trips, golf, horse riding and more. 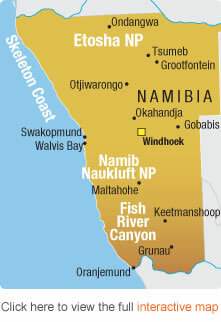 An activity briefing will be held on arrival in Swakopmund. (See price guide later in this document). Departure from Swakopmund is followed by arrival at the ‘Matterhorn of Namibia’ - Spitzkoppe. The 1728 m high rock formation, one of Namibia’s most recognised landmarks, is well known as an ancient San sacred site. Explore the surrounding area and its San rock paintings or simply enjoy the magnificent views. After the visit to Spitzkoppe the group will head off to the next destination - Brandberg. Today’s drive takes the group further north through the Namibian countryside to the campsite, located in the vicinity of the National Park. 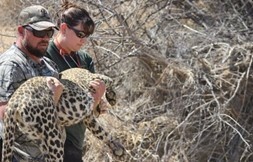 To-day the tour will head to the area of the Etosha National Park. . Covering 22,700 square kilometres, Etosha is Namibia’s premier nature reserve. Situated around the Etosha Pan with a large variety of animal and bird life, the extensive network of gravel roads affords the opportunity of accessing even the most remote areas of the park. After lunch, and once it has cooled off a bit, the remainder of the day is spent exploring the park's southern area. Travellers should keep an eye open for the striking Oryx and Springbok as these are endemic to desert National Parks. Tonight's camp is situated just outside the park boundaries, ony 10 km from Anderson Gate and there may be time for a quick dip in the pool or a sundowner on the deck before dinner, followed by a relaxing evening in the interesting bar. Today's exciting drive is across the park, keeping a look out for the many mammals, reptiles, birs and insects in the various regions. As the vegetarion types change, so does the animal and bird life that relies on it and so different sections of the park offer a variety of different game options. After a full day game viewing the evening is spent relaxing at the camp in the north of the park, Namutoni. 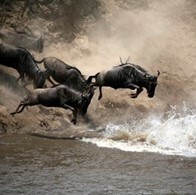 After dinner why not head to the waterhole and view the animals that come to drink in the evenings. After breakfast the group will head out of the Park while enjoying a game drive. To-day's drive will be through small rural towns and scenic landscapes. Nestled between the hills Windhoek is a rather small capital city but has many places of historic interest. This afternoon is spent at leisure with time to visit the local museum or haggle at the street markets. There are also many shops for those in need of a bit of retail therapy. This morning the group will depart early as they prepare to leave Namibia behind them as they enter into beautiful Botswana. Ghanzi is a town in the middle of the Kalahari Desert. Optional activities include the opportunity to interact with the San Bushmen and to discover how they survived in the Kalahari. Maun is the starting point for travel into the Delta and it is from here the exploration of the Okavango Delta begins. Tonight provisions are packed for the overnight excursion. Passengers are advised to take along a smaller daypack that can be used to pack the supplies needed for this short excursion. The trip leader will give a briefing on what is needed and what to expect. The Delta is a huge expanse of water which has travelled from the Angolan Highlands, spreading out to form the largest inland delta in the world. Studded with exotic islands the Delta is renowned for its incredible variety of bird life and animals and is unique to Southern Africa..
A fantastic chance to sit back, relax and have cameras at the ready while drifting along through the dozens of mazes. The Okavango Delta is a bird lover’s paradise enjoyed by all and best explored by foot and mokoro. With over 400 species of birds, 70 species of fish and an abundance of wildlife, the experience in the delta leaves everyone wanting to explore the whole of Africa. Here there will be the opportunity to take the included Overnight Excursion into the Delta. After rising early the expedition vehicle will be packed and the group will drive north from Maun for a couple of hours to reach the mokoro polers' station. The Delta region is studded with many local villages where many families live in a traditional way. Some of the villages are very remote and can only be reached by the traditional mode of transport, the Mokoro. Mokoros are traditional dug out canoes manoeuvred through the waterways by local guides who “pole” them through the reeds. The guides are met at the Mokoro Polers' station and supplies are packed before heading out onto the waterways. After a couple of hours along the waterways the group will arrive at the mobile tented camp situated in the heart of the Okavanvo. On arrival the local staff will be met who will be the hosts for the visit. A brief introduction to the camp will show the dome tents with twin beds and a bush en-suite bathroom - long drop toilet and a bucket shower. 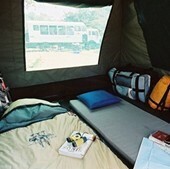 There will be time to relax in the tent with a cold drink or take a paddle in the Delta in a canoe. 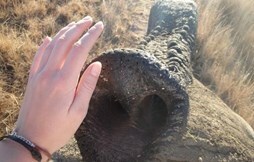 The activities at the camp include mokoro trails and guided walking. After the mokoro ride and vehicle transfer the group will arrive back in the early afternoon to have the chance to complete the picture of the Okavango Delta by taking an optional sunset scenic flight over the Delta (dependent on weather condtions and availability). This beautiful part of Botswana will be left behind this morning as the group departs for the lush campsite called Elephant Sands, driving through a very unpopulated landscape on the way where the donkeys roam freely. 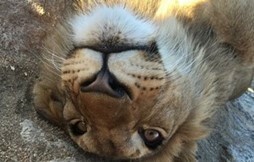 On arrival at the campsite there will be the opportunity for a game drive or a bush walk. 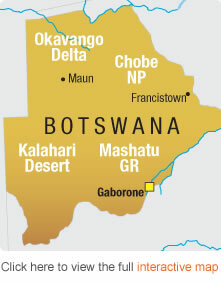 Travelling north to the town of Kasane, camp is set up on the banks of the Chobe River which forms a border between Botswana and Namibia and Zambia and is tne main water source to the Chobe National Park. 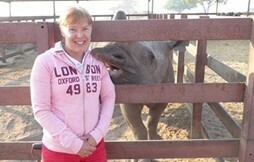 Elephant, hippo and many bird species can be viewed from the campsite while another glorious African sunset is enjoyed. Listen out for the resident hippos! This morning there is the chance to sleep in or explore tne town of Kasane. When everyone is packed up and ready the tour will leave for the Chobe National Park Overnight Mobile Excursion - an overnight experience in the wilds of the Chobe National Park. Chobe is one of Botswana's premier game parks, renowned for its large elephant herds. The afternoon is spent in search of wildlife while game driving to the camp within the park where the evening is spent surrounded by the night-time noises of the local wildlife. A look out should be kept for the rare Sable and Roan Antelope with their majestic backward slanting horns, or try to keep count of the Lilac Breasted Rollers that swoop by. After the night in the bush the group will head out early to continue the search for wildllife before packing up the camp and heading back to Kasane and on to Victoria Falls. .
On returning to camp everyone will get back onto the truck and continue to the border with Zimbabwe. 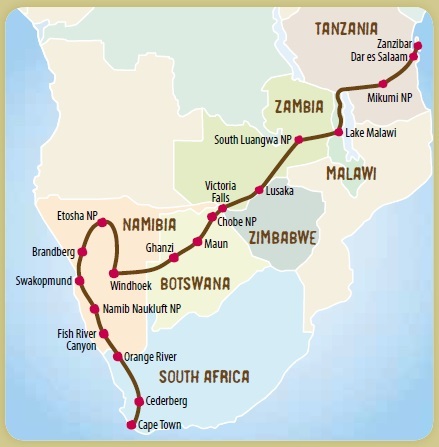 Once border formalities have been completed, there will be a short drive to the nearby Victoria Falls. Named after the famous World Heritage Site and Falls, the town of Victoria Falls is situated on the Zambezi River and surrounded by the Victoria Falls National Park. The campsite is conveniently situated in the centre of the town and within walking distance of the adventure booking agents, restaurants and shops. A short walk down the main road leads to the entry point to view the Falls which are situated between Zimbabwe and Zambia. Victoria Falls, or Mosi-oa-Tunya (the Smoke that Thunders) was named by David Livingstone on his explorations and is one of the Seven Natural Wonders of the World and it’s not difficult to see why. At 1700 m wide and around 100 m high, this is the world's largest sheet of falling water and a memorable sight on any African Safari! After the adventure activities briefing the rest of the afternoon is spent relaxing at the campsite’s swimming pool, viewing the Falls themselves or exploring the many sights and delights of this town! With so many exciting areas to explore within this beautiful country with its enjoyable weather, it makes it difficult to know where to begin. The adventure activities in the town of Victoria Falls along with the Falls themselves are an absolute must. Hwange National Park offers spectacular game viewing, while the Great Zimbabwe Ruins offer a chapter out of Zimbabwe’s history. The next two days are spent relaxing or participating in a myriad of Optional Excursions. Some fellow passengers will leave the trip here, to be replaced by new passengers joining for the next leg of the trek. Optional activities: Adrenalin junkies can bungee from the Victoria Falls Bridge connecting Zimbabwe and Zambia or abseil down the Batoka Gorge - neither activity is for the faint hearted! All year round, flights in fixed wing, micro light and ultra light aircraft or helicopters provide an aerial perspective over this magnificent World Heritage Site. White water rafting on the Zambezi is world class. Beside the excitement of the Grade 5 rapids, there are the "floats," where there is time to admire the scenic cliffs and the occasional wildlife on the riverbanks. 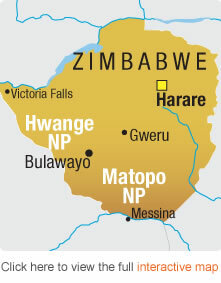 Leaving Zimbabwe the group will cross the border into Botswana and once border formalities have been completed, will continue to the town of Kasane on the banks of the Chobe River. After lunch there will be time to relax and in the afternoon the group will leave for a second opportunity to take part in the Chobe Overnight Mobile Excursion. After this second night in the bush the group will head out early to continue the search for wildlife, before packing up the camp and heading back to Kasane. Once everyone has returned to the camp at Kasane they will get back onto the truck and continue to the town of Livingstone where there will be the opportunity to view the Falls from the Mosi-oa-Tunya National Park, Zambia or take an optional sunset boat cruise on the Zambezi River. Another fantastic photo opportunity. 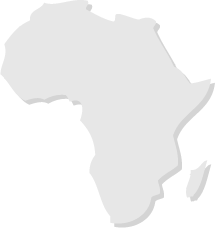 Prosperous during the copper boom in the 60s, Zambia was able to build infrastructure at the main mining and farming communities. After the fall of the copper industry, the country was left virtually bankrupt and existing infrastructure was left to fall to ruin. 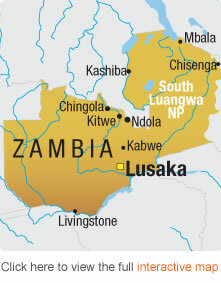 Due to foreign investment and a rise in the mining industry, Zambia is today once again starting to prosper. The difference is evident in the cities with the availability of foreign stores, banks and imported cars, while the villages and smaller towns are still to catch up. An early morning start sees the group head north through southern Zambia, passing through a few of the villages and towns of Zambia along the way. The campsite is home to some local wildlife including the largest antelope – Eland. This beautiful park is situated on the Luangwa River in the Eastern part of Zambia and is the southernmost of three national parks in the region. South Luangwa was founded in 1938 as a game reserve and in 1972 it was declared a national park and today covers more than 9000 kilometres squared. Giraffe, buffalo and elephant can be found in abundance the the Luangwa River is home to many a hippo and croc. 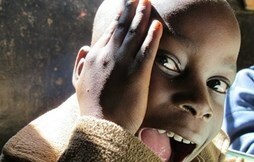 Leaving Zambia the tour will cross into Malawi, the ‘Warm Heart of Africa'. 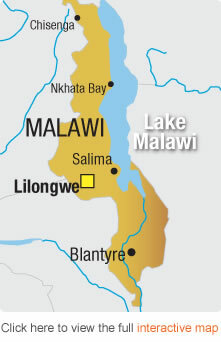 Malawi is a landlocked country with 20% of its total area made up of beautiful Lake Malawi. Camp will be first at the central lake and then in the northern area over the next three days. Spend the days days learning the game of bao from the locals, scouring the markets for a bargain or simply relaxing on the pristine beaches. Malawi’s temperate climate allows for swimming in the clear blue fresh-water lake all year round. Explore the beautiful shore and happen upon the local fishermen sorting their catch. Traditional fishing techniques are still practiced and to appreciate their boating skills, try to paddle a dugout canoe for yourself! At night the "fairy" lights of the fishermen on the lake can be seen. The various beachside campsites along Lake Malawi’s shores offer many optional excursions including a variety of water sports, horse back rides and a visit to the local village and school. After a relaxing three days, the group will leave Malawi, entering Tanzania through the border post at Songwe. Take in the beauty of the Tukuyu tea and banana plantations before heading towards Iringa where the night will be spent in the beautiful rustic ‘Farmhouse’ campsite famous for its Amarula Hot Chocolates and its steamy showers! Today, head to Dar es Salaam passing through the Mikumi National Park where it is possible to view a range of wildlife from the roadside, totally impervious to the passing traffic. To-day's drive time is extended due to the heavier amount of traffic heading into the ity, but the sights and sounds of Dar's vibrant outer suburbs are sure to keep everyone entertained - look out for the colourful shop fronts with their sometimes humorous catch phrases. On arrival in Dar es Salaam the lovely seaside campsite is reached in time to prepare for departure to Zanzibar the next morning. 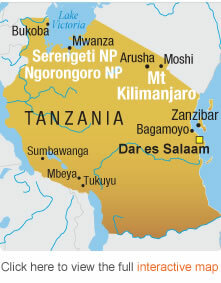 A ferry from Dar es Salaam is taken to the "Spice Island,” where the next three nights will be spent. Zanzibar is steeped in history and was one of the major starting points for most East African explorers in their quest for new lands. New passengers may join here to replace those leaving at the end of the excursion to Zanzibar. Please note: Meals are not provided whilst on Zanzibar, as experience has shown that passengers prefer to explore the island on their own and in accordance with their own budget. The Trip Leader is available and will arrange activities, while meals can be enjoyed from a wide selection of restaurants. There are also many optional excursions available. Leaving Zanzibar and returning to the mainland and after exchanging addresses, everyone parts ways having just experienced a trip of a lifetime. Please note that this itinerary should be used as a guide only and may vary from day to day depending on road and weather conditions and group decisions. 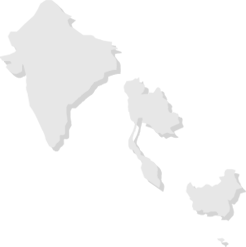 All local payments are subject to change with prior notice. Due to tourism laws in some countries visited there may be a truck and crew change during the trip. Below is a selection of Optional Activities available on this tour - and there are plenty more to choose from. Please note that this is not a full list of activities available - there are plenty more to choose from. All prices are in US dollars and are approximate and are subject to change, and where activities occur away the base, there may be a transfer cost. Please also note that all activities must be paid for in US$ cash. Flights should be arranged to arrive into Cape Town International Airport. Please make sure that you arrive in plenty of time for your trip departure. We recommend that you arrive the day before your start date and depart the day after your end date to allow for any delays. An airport pick up on arrival and the pre-tour night's accommodation in a dorm room are included in the price. Full details will be in provided in your pre-departure pack.